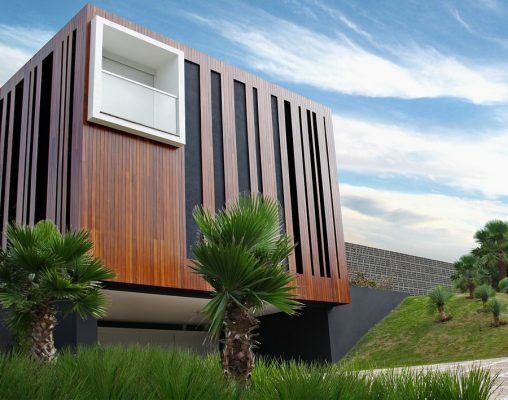 After years living in China and Switzerland, the owners of this home decided to settle in Londrina. 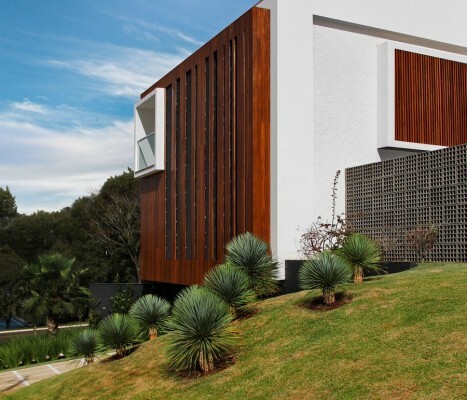 This Brazilian and Portuguese / Swiss couple wanted to provide a quiet, tranquil home, in which to raise their two children, away from busy urban centers. With this in mind and after much searching, they chose a house close to both quality schools and other important community services. 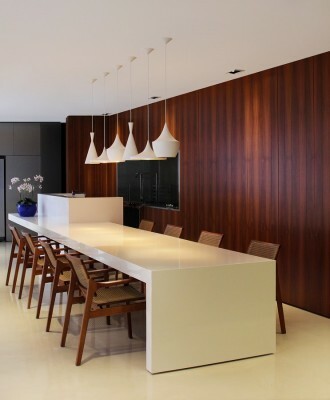 Unfortunately, the house didn’t meet the family’s expectations so they decided to do a major renovation to both the internal and exterior areas of the home. 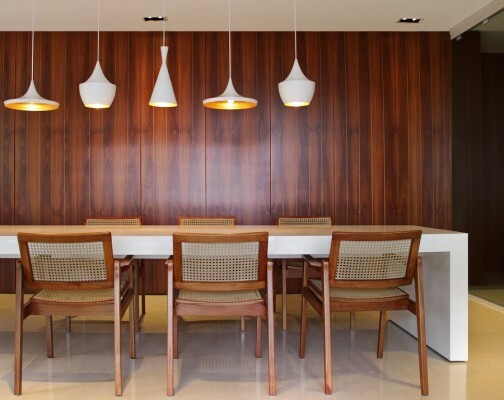 With a desire for a complete integration of space in a clean visual and easy to care for style, a complete renovation project was planned for the kitchen, living room, hall, bathrooms and barbecue, and outside dining area. This involved pulling down walls, closing windows, constructing new walls, wooden louvers and cast concrete elements that would seal external views and visibility from the street. The existing travertine floors were redone with a polymeric cement (Cement Design) giving a unity and cosmopolitan look to the home. “We love this floor that we had in our apartment in Zurich”, says the owner. The same finish was used in the hall and bathroom with both the floor and wall being coated. “We got a contemporary and dramatic entry instead of the overdone decorated hallway”. “We wanted the hall to have an institutional aspect almost like a banker” say the ZIZ architects. 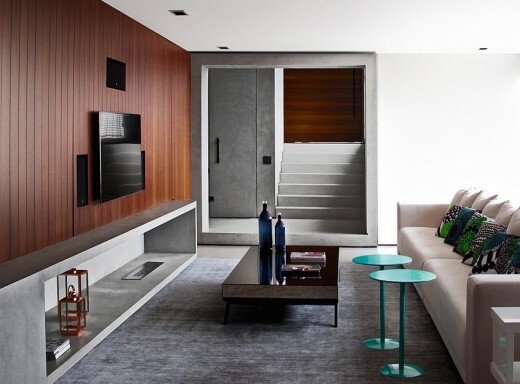 In order to attain the desired visual effect, the walls of the home were done in wood paneling in combination with the gray cement finishes. These cabinets conceal ample space for electronic equipment that doesn’t need to be visible. A conventional wood burning fireplace was converted into a biofuel one, as a remembrance of the wonderful time and “colder” days spent in Switzerland. 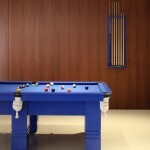 A beautiful blue lacquer pool table, designed especially for one of the homeowners, centers a game area that then leads into a gourmet barbecue grill niche finished in stainless steel. 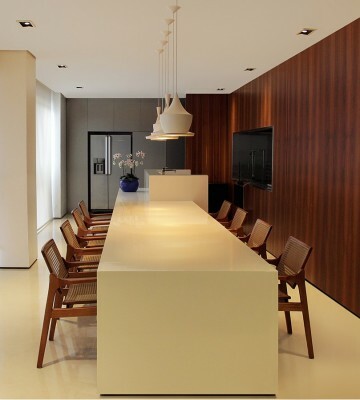 This area of white silestone hides the desktop from those sitting at the white lacquer table decorated with pendants by the outstanding Tom Dixon. Generous glass doors then make the connection to a luxurious patio area complete with a swimming pool, choice landscaping and a large deck constructed of Cumaru. The area virtually embraces the house and invites leisure time and socializing, which the family loves to do on a daily basis.